Famed classical guitarists from around the globe serenaded fans and music students from Thailand and overseas during last month’s Pattaya Guitar Festival. Organized at the Siam Bayshore Resort & Spa, and officially opened by deputy mayor Ronakit Ekasing, this first-class music-adventure owes a lot of thanks to the owner of the hotel, the lady of jazz herself, Kamala Sukosol. Thanks should also go to the Thailand Guitar Foundation for their help in organizing the event and for their great choice of classical guitarists. Guitar lovers tried out instruments from some of the top guitar makers. The festival kicked off on Saturday, October 23 when Leon Koudelak of Switzerland, and Flavio Cucchi and Alessio Monti of Italy entertained the audience with beautiful pieces ranging from Handel to Villa-Lobos. 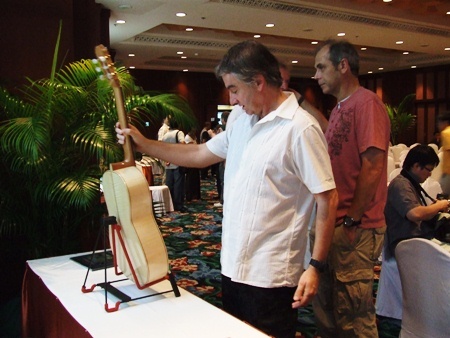 The final and concluding part of the festival took place the following weekend, on Saturday October 30, and began with an afternoon guitar exhibition with many beautiful instruments on display and for sale, some costing as much as 100,000 baht. Budding musicians could chat to the guitar manufacturers and also have their own instruments tuned up by the professionals. 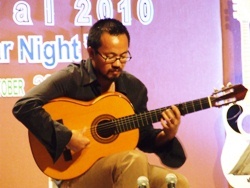 There then followed a music workshop featuring international and Thai guitarists to educate music students from Germany, Japan, the United Kingdom, and Thailand. The entertainment continued into the evening with the guitarists providing some upbeat sounds with the “Flamenco Classic” concert featuring some inspired numbers. The absolute highlight of the festival for most was the part “Flamenco meets Classical” performance by Thai born Flamenco-player Tana Suebsiri. Tana studied architecture in Germany but became bored with his studies and went to Cordoba in Spain to live with a family of gypsies from whom he leant how to play Flamenco music. The result of his musical influences is a concoction of strong guitar rhythms accompanied by the melodic atmosphere of Granada and Seville. 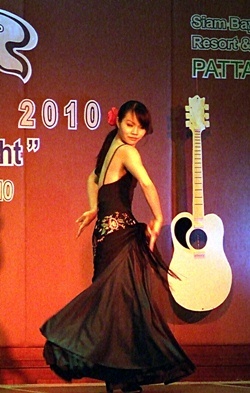 The performance was enhanced by two Thai-Flamenco dancers who strutted their stuff in time with the music. The festivities concluded in the evening with a jam session featuring Santi Kaaewjai, Worathep Rattanaampawan, Pongpat Pongpradit and Tomonori Arai to wrap up another superb event. Organizers have pledged to donate a portion of the proceeds of the guitar festival to the Father Ray Foundation. A Flamenco dancer performs to the intoxicating music of southern Spain. 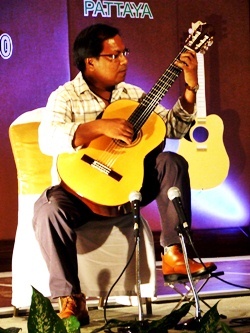 Naruepol Chamchamrat is one of the Kingdom’s leading classical guitar teachers. Tana Suiebsiri delighted the audience with his ‘Classical meets Flamenco’ solo. 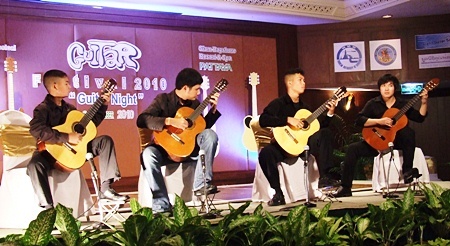 The Thailand Guitar Society students concert show.